The GST system provides a provision of e-Way Bill, a document to be carried by the person in charge of conveyance, generated electronically from the common portal. ** Single e-Way Bill for movement of the goods throughout the country. ** To prevent the evasion of tax. ** Hassle free movement of goods across India. ** Tracking the movement of goods with e-Way Bill number. ** Easier verification of the e-Way Bill by officers. The registration mechanism for the GST taxpayers for the e-Way Bill system is a simple process. One time GST taxpayer needs to register on this system. E-Way Bill system provides the users to generate the e-Way Bills from different modes. There are like Web based, SMS based, android app based, API based and Suvidha based. Step 1 : Go to the official website of Goods and Services Tax e – Way Bill System through the URL provided above. Step 3 : The user needs to enter his/her GSTIN number along with the displayed captcha and shall click ‘Go’ to submit the request. Step 4 : Once the request is submitted Applicant name, Trade name, Address, Mail ID and Mobile Number are auto populated once the user enters his/her GSTIN number along with displayed captcha. If the details have been changed or are incorrect, the user needs to click ‘Update from GST Common Portal’. Step 5 : User needs to click on ‘Send OTP’ to get the OTP. 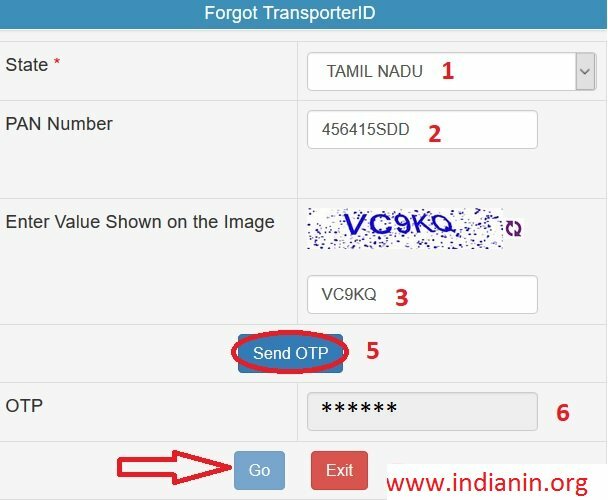 Once OTP is received on the registered mobile number, user needs to enter the OTP and click on ‘verify OTP’ to verify the same and validate. Step 6 : Next, the user needs to provide his choice of User ID or username, which he/she plans to use to operate his account on this system. Username should be about 8 to 15 alphanumeric characters and can include special characters. Step 7 : After authenticating these details, the system generates the 15 characters of Transporter ID and user credentials for him. The enrolment form asks for his PAN details, business type, business place, Aadhaar or mobile authentication. Step 8 : For enrolling, the un-registered transporter has to open the e-Way Bill portal and select the ‘Enrolment for Transporters’ option. Step 9 : The user has to select the State and enter his legal name as given in his PAN and PAN number. Step 11 : After that he will enter his business details and contact details. Step 12 : The user has to then enter his Aadhaar number related details, if Aadhaar card is available with him and verify them through OTP sent to his registered mobile. If the Aadhaar number is not available, user has to enter the mobile number and mobile is authenticated by sending the OTP to it. Step 13 : The user can then upload the Address and ID proofs (PoA and PoI) by clicking on respective ‘Upload’ buttons. Step 14 : Once the user clicks the ‘Save’ button, the system generates the 15 digits TRANS ID. 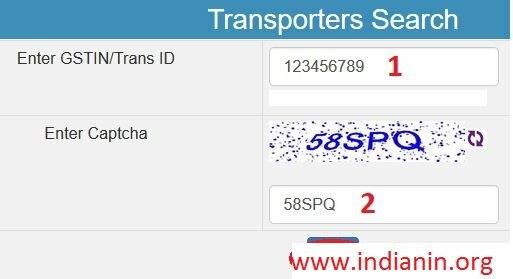 This TRANS ID, he can provide to his clients to enter in the e-way bill so as to enable the transporter to enter the vehicle number for movements of goods. 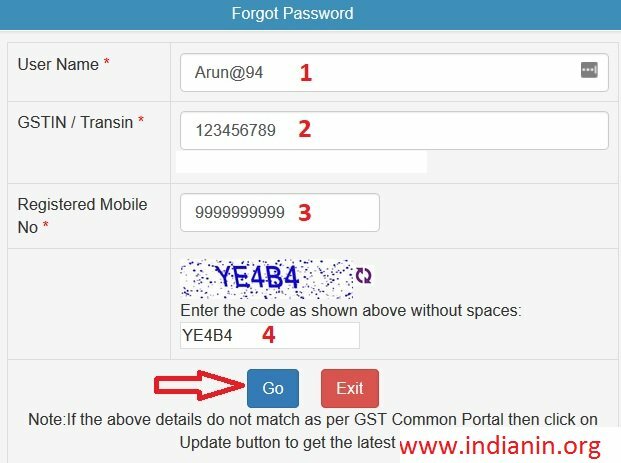 If the e-Way Bill user forgets his password for his username, he needs to enter the following details to reset your password. If the user of the e-Way Bill system has forgotten his username, he needs to enter the basic information of GSTIN. 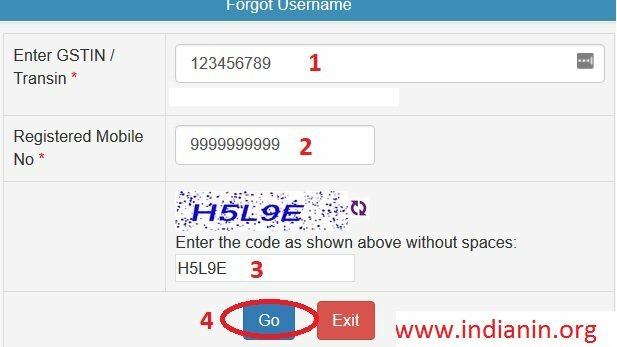 If the user forgot his Transporter ID then enter the following details to recover the Id. To search your e-Way bill visit the official website and Select e-Way bill link under Search tab in the Menu bar. Step 1 : When user selects the ‘Cancel’ sub-option under ‘E-way bill’ option, then the user needs to enter the 12 digit e-Way Bill number and select go. 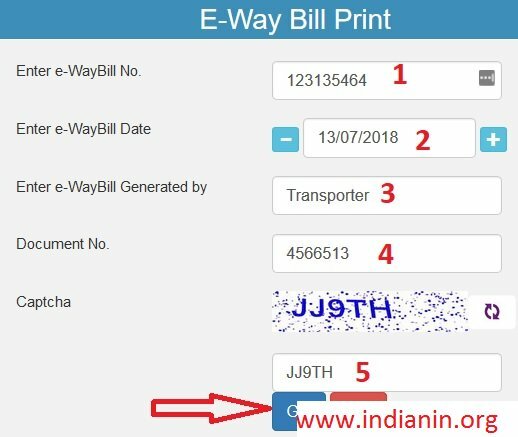 Step 2 : That particular e-way bill will be displayed, and after giving a suitable reason for the cancellation of e-Way Bill, the user can cancel the e-way bill. The e-Way Bill once generated cannot be deleted. However, it can be cancelled by the generator within 24 hours of generation. ** If the recipient is not getting the consignment mentioned in the e-Way Bill, he/she can reject them using this option. ** A user needs to the select the e-Way Bill number by selecting the date on which the e-Way Bill was generated and click submit button. ** The system will show all the e-way bills generated on that particular date, select the concern e-Way Bill and shall reject the e-Way Bill by checking the check box on the right side of the e-Way Bill. If I have to cancel GST number then what I will do. Please tell me.